The Coast Guard has asserted in the past and believes today that consistent standards of universal application and enforcement, coupled with Federal initiatives to meet unique regional concerns, best meet local and national safety and environmental goals with the least disruption to maritime commerce. 78 Fed. Reg. 79,243. That declaration is followed by a carefully drafted proposed rule setting out a “general restatement” of maritime preemption principles and the agency’s revised “assessment framework” for determining the preemptive effect of its regulations. After noting that several recent judicial decisions signal that more explicit preemption statements are instructive and helpful, the Coast Guard makes it clear that one purpose of this new rule is to “make the Coast Guard’s view of the preemptive impact of certain regulation more obvious.” A second purpose is to “avoid or reduce confusion related to State and local governments’ attempts to regulate in preempted areas.” Close study of the proposed preemption assessment framework rule suggests that the coming final rule establishing the towing vessel inspection program is almost certain to preempt state regulations in the same field. On December 27, 2013, the Coast Guard issued a proposed rule setting out its “assessment framework and organizational restatement regarding preemption for certain regulations issued by the Coast Guard” (78 Fed. Reg. 79,242-52). The proposed rule responds to a May 20, 2009 memorandum by President Obama addressed to the heads of executive departments and agencies. That memorandum imposed both prospective and retroactive obligations. First, it imposed new restrictions on federal agencies regarding any future decision to include preemption provisions in their regulations. More specifically, it directed that any preemption provisions issued by federal agencies must be justified under the legal principles governing preemption, including those outlined in Executive Order 13,132. The presidential memorandum’s stated purpose was to ensure that preemption of state law by executive departments and agencies is undertaken only with full consideration of the legitimate prerogatives of the states and with a sufficient legal basis for preemption. Second, the memorandum directed all agencies to review any preemption statements they issued before the memorandum was released, to ensure those prior statements comply with the new policy. The Coast Guard’s assessment framework rule is responsive to both directions by the president. While the 2009 presidential memorandum provided the occasion for the Coast Guard’s December 27th rulemaking, such presidential memoranda cannot alter existing federal law. Thus, the proposed Coast Guard assessment framework rule quite appropriately acknowledges the binding effect of the rules of maritime preemption laid down by the U.S. Supreme Court in two decisions striking down state tanker laws (Ray v. ARCO, decided in 1978, and United States v. Locke, a unanimous 2000 decision). Drawing on those cases and others, along with the statutes enacted by Congress that provide the authority to issue regulations, the proposed preemption rule describes the three forms of preemption articulated by the Supreme Court (express preemption, field preemption and conflict preemption). It then applies an assessment framework derived from those statutes and cases to selected regulations promulgated by the Coast Guard in Titles 33 and 46 of the Code of Federal Register (C.F.R.) before the proposed rule is made final. The drafters made it clear, however, that the list is not intended to be exhaustive. 33 C.F.R. § 1.06-1(b)(1). The proposed rule also sets out the framework the Coast Guard will apply in analyzing the preemptive effect of regulations issued after the proposed rule is made final and provides guidance on how it will conduct case-by-case preemption determinations. With respect to the first category — selected regulations issued prior to the date on which the proposed rule becomes final — the Coast Guard addressed the preemptive effect of seven categories of regulations: (1) regulations issued under authority of Title I of the Ports and Waterways Safety Act (as amended); (2) regulations issued under Title II of that same Act; (3) regulations falling within the “overlap” between Titles I and II of the Act; (4) regulations issued under 46 U.S.C. chapter 32; (5) regulations issued under 46 U.S.C. chapter 33; (6) regulations issued under 46 U.S.C. §§ 3717 and 6101; and (7) regulations issued under 33 U.S.C. §§ 1901-1912. For each of the seven categories, the Coast Guard identified the relevant preemption form (express, field or conflict) and applied the preemption rule to previously issued regulations. The table below summarizes the proposed framework (readers should consult the actual rule to determine the preemptive effect of individual regulations falling within these categories). The Coast Guard’s new preemption assessment framework will also be applied to regulations promulgated by the Coast Guard after the final assessment rule is published. Most readers are no doubt aware that the final Coast Guard rule on towing vessel inspections is long overdue. Many appear to assume that, once promulgated, the final rule will preempt state regulation of towing vessels covered by the rule. Assuming the final towing vessel inspection rule adheres to the assessment framework established by the proposed rule on preemption, that assumption appears well-founded. 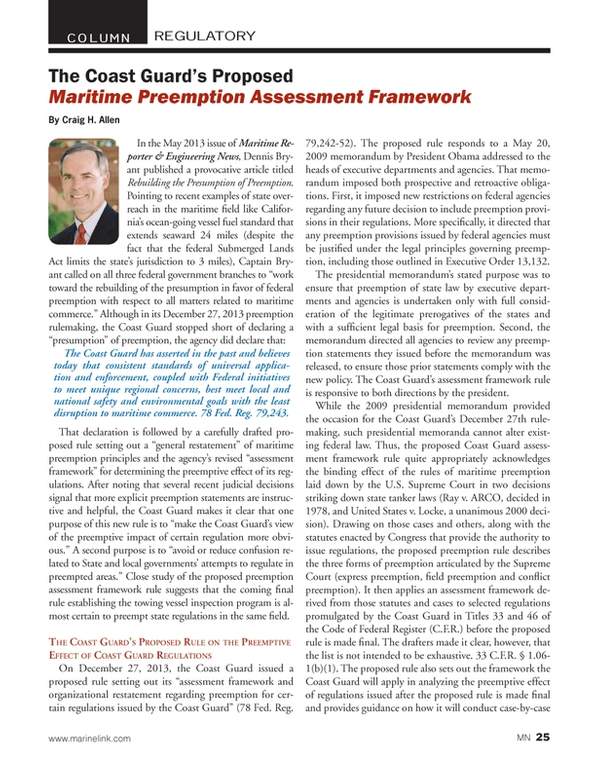 Properly applied, the preemption assessment framework set out in the December 27 rule strongly suggests that any regulations promulgated by the Coast Guard under authority of 46 U.S.C. chapter 33 fall within the field preemption category. Similarly, the Coast Guard has determined that the field of vessel safety management is preempted. Accordingly, any towing vessel inspection regulations issued under 46 U.S.C. chapter 33 and any towing vessel safety management regulations issued under 46 U.S.C. chapter 32 should preempt state regulations of those fields. The proposed preemption framework rule is a positive first step toward compliance with the 2009 presidential memorandum and promises to bring needed clarity and predictability to maritime preemption analysis. The importance of the rule lies in the deference federal courts give to an agency’s decisions regarding preemption of state laws. Although there is a presumption against preemption when a state exercises its historic police powers, the Supreme Court in the Locke case rejected such a presumption when a state attempts to regulate maritime shipping. It is well established that “federal regulations have no less preemptive effect than federal statutes, and agency regulations may preempt state regulation expressly or by implication.” The Supreme Court has held that agency statements on the question of implicit intent to preempt state regulation are dispositive unless either the agency’s position is inconsistent with clearly expressed congressional intent or subsequent developments reveal a change in that position. Similarly, the Court has recognized that the regulating agency may be “uniquely qualified” to determine whether the state law stands as an obstacle to the accomplishment and execution of the full purposes and objectives of Congress. By contrast, the Court has held that agency regulations do not preempt state regulatory authority where the regulations did not specifically express preemptive intent. The Coast Guard is to be congratulated for this important undertaking. Nevertheless, the “federalism” statements accompanying recently published rules suggest that the goal of greater clarity and predictability will present a challenge to the agency’s rulemaking teams, particularly with the regulations falling within the “conflict” preemption category. Some regulations are fairly straightforward. For example, the Coast Guard’s preemption analysis in the 2012 Ballast Water Discharge final rule (77 Fed. Reg.17,253, March 23, 2012) was simplified by the fact that Congress expressly saved state regulatory power to adopt or enforce control measures for aquatic nuisance species (16 U.S.C. § 4725). The course having been expressly set by Congress, the Coast Guard concluded in its rule that “In light of this provision, the Coast Guard cannot legally preempt State action to regulate discharges of ballast water within State waters” (something many commenters had recommended) (77 Fed. Reg. 17,280). Similarly, in the proposed rule promulgating Changes to the Inland Navigation Rules the Coast Guard determined that the subject falls within the field preemption category. Accordingly, the agency concluded that “based on the President’s 2009 memo and the preemption principles outlined in EO 13132, the Coast Guard proposes to add the following sentence to 33 CFR 83.01(a): ‘The regulations in this subchapter have preemptive effect over State or local regulation within the same field.’” (77 Fed. Reg. 52,175, at 52,186 Aug. 28, 2012). A third example of a straightforward preemption analysis can be found in the final rule implementing the Manila Amendments to the STCW Convention (78 Fed. Reg. 77,795, Dec. 24, 2013). Those regulations were also found to be within the field preemption category (78 Fed. Reg. 77,780-81). This rule describes the standards to which nontank vessel owners or operators will adhere when preparing and submitting plans for responding to a discharge of oil from their vessels. This rule will not preempt the various State laws on this topic. We drafted this rule to ensure that, to the extent practicable, it is consistent with any applicable State-mandated response plan in effect on August 9, 2004. We contacted the National Conference of State Legislatures to circulate the NPRM to the States for their awareness of the proposal. We conducted a search of State laws addressing NTVRPs and conclude that no State law is preempted by this final rule. Interested readers may submit comments on the preemption framework proposed rule to the Coast Guard until March 27, 2014. Instructions for submitting comments are included in the Federal Register notice.